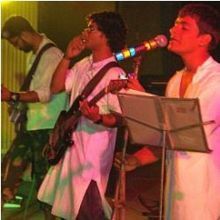 Once upon a time a vocalist having strong affinity towards Indian Classical and Grunge Alternative and a guitarist inclined more towards Blues and Jazz met, and Desh was formed! Desh are more of a thought than a band. As the name suggests. they are more into experimentation with Indian root music. They are doing more of Indian Classical and Bengali Folk as covers and as originals, and in their compositions one would find a touch of both genres. Why Book Desh Through ArtiseBooking?